On YouTube I finally got around to sharing a DIY video. 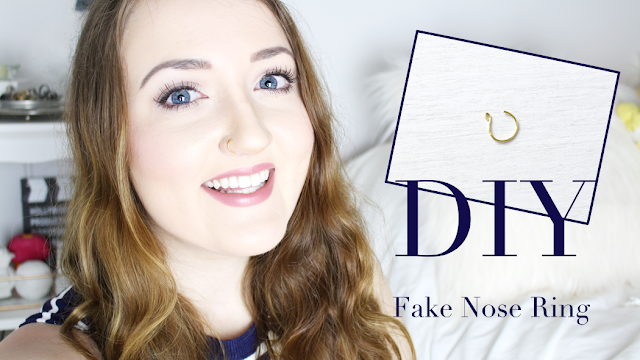 For my first one I decided to transform my most popular blog post, a DIY fake nose ring, into a video. With this reinvention I thought I’d also share an updated supplies and steps list and some benefits of opting for a fake nose ring on here. Personally, I find piercings to be very cool and a great way for people to express their style and personality. I myself only have my ears pierced once; however I’ve contemplated getting a second hole and my nose pierced. Recently I was going to get a second piercing done, but I chickened out. Perhaps one day I’ll get the nerve to; however for now I’m content. A while ago I decided against getting my nose pierced after seeing my friend nearly pass out after getting hers done and having seen her cartilage get infected, which forced her to let the hole close up. I am not one to tolerate that sort of pain well and am prone to irritation/infections despite thorough cleaning and a regimented routine, so I figured better not give into this trend. Plus, I am indecisive and as my style and professional life evolve, perhaps I wouldn’t even want a nose piercing down the road. That's why a a fake nose ring is a perfect alternative for myself, and I'm sure it would be for others, too! 1. Wrap the wire around the pencil. 2. With needle nose pliers, bend one end of the wire back about 1/4 inch. Press/clamp it down to the wire. This end will go into the nose. Having it rounded will reduce the chance of cutting and provide better grip. 3. With wire cutters/side cutter pliers cut the wire 1/8-1/4 inch before the excess wire overlaps the rounded end. This will provide a solid spacing for your nose. 4. (optional) With a file, file down and round out the end of the wire that will rest on the outside of your nose. This should also help to prevent superficial scraping. 5. Adjust the hoop accordingly for it to rest comfortably on your nose. Have you considered getting your nose pierced? Would you try this DIY as an alternative to achieve this trendy look? Disclaimer: This DIY (from personal experience) may cause a superficial scrape on the outside of your nose. Adjust the ring accordingly or, if encountering a similar scenario to myself, take it out. Clean the ring well and often. Please note I am not a professional; simply a lover of DIYs and crafts. Complete all projects seen on my channel or blog at your own risk. I am not responsible for any harm or injuries that may occur. Be smart and safe, lovelies! I used to have my nose pierced and have recently thought about getting it done again, but really I'd rather it wasn't permanent so this is absolutely perfect! Will definitely give it a go, it looks great!